Ignition is a special issue of the long running BIONICLE Comic series' Ignition series. It is preceded by BIONICLE 27: Fractures and is followed by BIONICLE Ignition 1: If a Universe Ends. 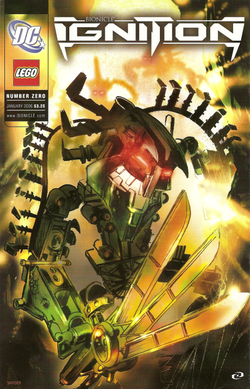 It is also the first BIONICLE Comic to be drawn by Stuart Sayger. This issue only featured an interview with Stuart Sayger and a fold-out poster. Facts about "BIONICLE Ignition 0"